La Libertad is a region in northwestern Peru. Formerly it was known as the Department of La Libertad (Departamento de La Libertad), a political division that generally corresponds to a state in the United States of America. It is bordered by the Lambayeque, Cajamarca and Amazonas regions on the north, the San Martín Region on the east, the Ancash and Huánuco regions on the south and the Pacific Ocean on the west. Its capital is Trujillo, which is the nation’s third biggest city. The region’s main port is Salaverry, one of Peru’s largest ports. The name of the region is Spanish for “freedom” or “liberty”; it was named in honor of the Intendencia of Trujillo’s proclaiming independence from Spain in 1820 and fighting for that. La Libertad is the only Peruvian region that includes all three natural regions of the nation: coast, Sierra (highlands), and selva (rainforest). Trujillo, the capital, has a strategic location, near where the Andes come closest to the coast. Seen from Trujillo, the Andes appears as a row of low-elevation hills. The Andean Plateau increases altitude sharply to the east, in the provinces of Otuzco and Santiago de Chuco. These two provinces comprise the Pacific hydrographic watershed, which give rise to the Moche and Virú rivers, to the south, and Chicama River to the north. Pacasmayo Province, located more to the north, is along the coast. To the east, Sánchez Carrión Province waterways drain into the Amazon River and thus belong to the Atlantic Ocean watershed. The coastal strip set the stage for the rise of many pre-Columbian cultures, such as the pre-Ceramic Huaca Prieta civilization, which is more than 5,000 years old & the Cupisnique, which is more than 3,000 years old. From 200 A.C., the first one to expand beyond its cradle was the Moche or Mochica culture. It was basically an agriculture and/or a warrior culture, which built countless temples and palaces such as the Sol (Sun), Luna (Moon), El Brujo & Cao Viejo, and other huacas. The Chimú culture emerged later and built its capital in Chan Chan, the largest pre-Columbian city in South America, & huacas like Esmeralda & Arco Iris (Rainbow). At its zenith, Chan Chan was home to 60,000 inhabitants who stubbornly resisted the expansion of the Inca Empire. These ancient cultures used irrigation canals and water reservoirs, which systems were increasingly better engineered and extensive over the years. The technological acumen of these sophisticated agricultural systems was carried into the Inca Empire, which surrounded the remnants of the prior cultures. The Spanish colonizers destroyed most of the agricultural works to more effectively establish political control and provide de facto slave labor from the displaced native agriculturalists. The archaeological remains of Chan Chan, 6 km (3.7 mi) northeast of downtown Trujillo, are rather well-preserved despite being built out of adobe (mud bricks), largely because 1) dearth of rainfall and consequent erosion, and 2) lack of significant re-use of its construction materials (adobes do not respond easily to removal and transport and are relatively cheap to make on-site in current methods of construction). International Calzaferia El Porvenir it is a fair of footwear and in 2012 took place the 10th edition; it is held in El Porvenir city. Regional Fair of the Pineapple it is held in the town of Poroto. Virgin of La Puerta Patronal Feast, the celebration originated in 1664 when it placed the image of the Virgin at the entrance of Otuzco as precaution of the risk of a pirate raid. The main day is celebrated on December 15 every year and in 2012 the feast of Our Lady of the Gate was declared a National Cultural Heritage by the Peruvian government. Contradanza, expression cultivated in Huamachuco city, in the villages Urpay, Shiracmaca and Culicanda. 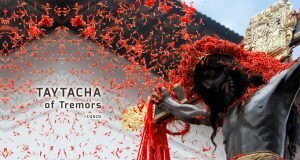 This dance in 2012 has been declared a National Cultural Heritage by the Peruvian government.